Take a break from your outdoor adventures and learn about the rough and tumble history of Durango, Colorado. 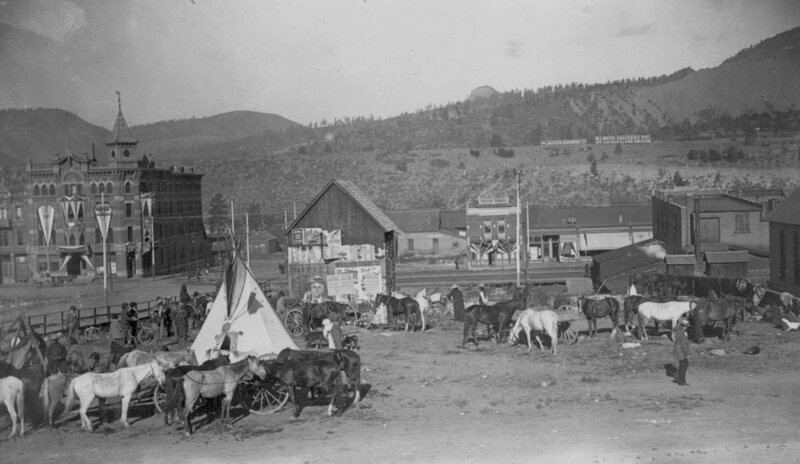 Iconic 1890's scene of downtown Durango where the Utes would trade and camp. Note the Strater Hotel on the far upper left. Come join Horsefly History Tours: History With a Bite! as we venture back in time to search for the hidden history lurking just out of sight in Historic Downtown Durango. If your jam is learning about dates and architecture these tours are not for you. HHT tours reveal the darker side of Durango's past; thus, "History With a Bite!" Miner’s flocked to Durango in the 1880’s and 1890’s in search of their fortunes. Men who spent their lives in dark dreary mine shafts chipping away with pick axes at cold dripping rock which too often entombed them. Miners described this work as being a living hell. These same miners may have been the ones to carve out a network of tunnels under Downtown Durango. Bootlegging was prevalent after prohibition and the tunnels aided in the transport of the illegal moonshine. Also used for coal storage and safe passage; some of the tunnels still exist. And Horsefly History has been given access to one of the most historically colorful and dramatic tunnels in existence. Once under a popular saloon (and today a local dive) the tunnel ran underground from the saloon to the entrance of a busy brothel. Come along on this Halloween themed tour and see the tunnel for yourself. Only Horsefly History Tours will guide you there. Along the way you will hear true ghost stories from the buildings and businesses that line Main Avenue. Restless spirits still roam the streets they did in life so long ago. Visit the site of the “hanging tree” where an angry mob of townsfolk lynched a murderous outlaw. Be silent as we listen for the voices of children who laugh and play in the dark. And brace yourselves for the grand finale where you will walk through a dark and creepy tunnel previously closed to the public. Our starting location is at Thru the Lense Photography Studio (643 A Main Ave, Durango, CO 81301) - A few doors south of the Strater Hotel. This tour focuses on South Main Avenue. This district was the dirtier part of town and therefore had more immigrants and affordable hotels. Visit the site of a notorious gun battle between two rival gangs. A hotel with a strange murder and the businesses of two famous Coloradans whom you may not have guessed lived in Durango. This tour is 1.5 hours. At this time, no children under 14. This tour will focus on North Main Avenue where various people have met their fate. A lover's triangle, an infamous duel, and a notorious family feud with a murderous ending are all subjects of the tour along with many others. This gift card is nonrefundable and expires one year from the date purchased. For those seeking only the highlight reel. This tour takes a one-way walk down Main Street learning about some of Durango’s most notorious people and events. We will meet at the Steaming Bean Coffee House in the old Colorado State Bank building where you can grab a coffee to sip along the way. On this condensed tour we will not be entering establishments (except in the meeting place). Some of the stories we will be sharing, at the very sites, include Durango’s only legal hanging and lynching, the fatal gun duel between the Sheriff & the Marshall, and the brothel with the lavish madam.